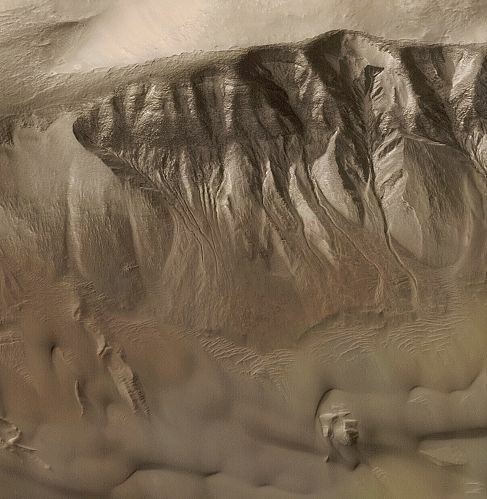 Explanation: The Gullies of Mars would probably not have been sensational enough for the title of a vintage Edgar Rice Burroughs story about the Red Planet. But it would get the attention of planetary scientists today. First identified in high resolution images of Mars recorded by the orbiting Mars Global Surveyor spacecraft, the gullies are interpreted as startling evidence that liquid water flowed across the martian surface in geologically recent times. Similar channels on Earth are formed by flowing water, but on Mars the temperature is normally too cold and the atmosphere too thin to sustain liquid water. Still, it is thought possible that water did burst out from underground layers and remain liquid long enough to erode the gullies, while alternative explanations suggest the erosion was produced by a flowing jumble of solid and gaseous carbon dioxide. 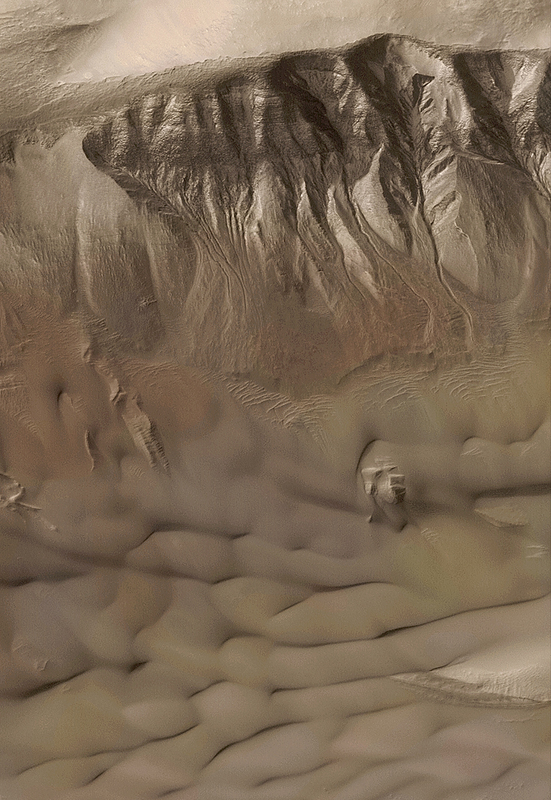 Spanning a few kilometers along the wall of an impact crater this high resolution image from Mars Global Surveyor shows typical martian gullies near the top of the crater wall giving way to sand dunes toward the crater floor. Whitish frost is visible near the top and on the dark sand dunes below. The muted colors were synthesized from wide angle image data.